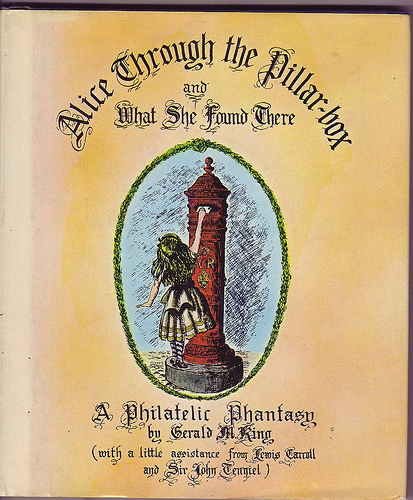 Alice Through the Pillar-Box by Gerald M. King. Subtitled: A Philatelic Phantasy (with a Little Assistance from Lewis Carroll and Sir John Tenniel). Published by Whizzard Press/ Andre Deutsch 1978. First edition hardback with dustjacket. Designed to resemble a stamp album with details of the author’s own fantasy stamps, first day covers and postmarks, all based on the Alice stories: King was frustrated in 1965 by the Post Office’s refusal to commemorate the 100th anniversary of Alice’s Adventures in Wonderland, so he created some of his own Wonderland stamps and stationery. This book brings the stamps together with other post-y bits and bobs. …the most brilliant and effective diversion on the Alice theme… Only a great lover of Alice, a fine artist, a considerable wit and an expert philatelist could have produced this fantastic tour de force. 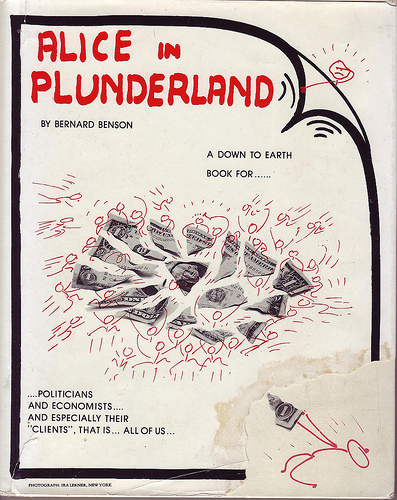 Alice in Plunderland by Bernard Benson. Published by The Minstrel Publishing Company 1978. Hardback with dustjacket. Signed and numbered 1,475 of 5,000.
spreads out before our eyes a lucid picture of the world which we and our leaders between us have created. ..but I can’t possibly comment as I haven’t managed to wade through it. It’s all done in 4 colour cartoons with handwritten text, and seems to be ‘Alice does politics’. I haven’t even managed to read enough to decide what sort of politics it is. Alice’s Adventures in Wonderland by Lewis Carroll. Tove Jansson is, of course, best known for the Moomins, who are currently undergoing something of a revival. I suspect that’s partly why this book comes up quite expensive. Jansson was born and died in Helsinki: 1914 and 2001. I’ll let you decide which date is which. She’s also illustrated the Snark, but I’ve yet to find that one. You can see all the illustrations here. I love the use of the Lewis Chessmen as models for the King and Queen of Hearts.